Promote your company and gain memory retention from both your customer and the computer its backing up data from! 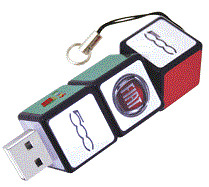 Plug it in, save data , files, mp3 songs, pictures and more and carry this awesome Rubiks Usb Drive with you at all times. The three rubik cube blocks independently move and allow colour matching - all the fun you get from a rubik's cube all in one. Your customers and clients will end up twisting the blocks for fun only to see and retain your company logo. Its genious and elegant design allow eye catching attention and will promote your company brand name logo. Customisable to your preference, and utilising useful electronic usb technology - presonalise your company logo and ensure this useful company freebie or business gift stays with your customers and clients. Name your memory size to your preference - 2 gigabyte, 4, 6, 8, or 16 Gigabyte options are available to ensure good speed transfer and reliability for safe file storage.